Flipping the calendar over to the New Year always brings an exciting time in NCAA basketball. While there are some outliers here and there of conference games occurring before January, the first month of the year widely marks the beginning of the conference season, which tends to mean some of the most dramatic and consequential games. As most anyone who has played, coached, or been a fan of college basketball will tell you, conference play is different, and the level of play tends to intensify visibly. There’s no telling in advance which will be the best games, or which teams may surprise us by rising to the top of their respective conferences. Going by the season so far however, and the schedules ahead, these are some of the potentially monumental games you should mark on your calendar if you want to have your finger on the pulse of the season – and be best prepared to fill out your brackets come March! A few times in the last few seasons it’s been Virginia, rather than Duke (or North Carolina) that has owned the ACC’s regular season. Duke is the top team in the nation however, and a popular national title favorite, which makes this early bout extremely interesting. As nothing less than a strategic betting guide to college basketball states, homecourt advantage is a magical thing in college basketball, and if Duke’s famous Cameron Indoor Stadium has its usual effect the Blue Devils could earn a key victory en route to an ACC title and an NCAA Tournament 1-seed. If Virginia can pull off the upset though, it will be in the ACC driver’s seat, and perhaps in line for a 1-seed of its own. This season, it goes without saying that Michigan and Michigan State will be in the mix for the Big Ten title, and for top seeds in the NCAA Tournament. Both teams are at this time in the top five in the Ken Pomeroy rankings (which are consistently accurate in projecting NCAA Tournament fortunes), and both have looked elite at times. This game in late January, however, will go a long way toward determining if the Big Ten is a two- or three-team race. 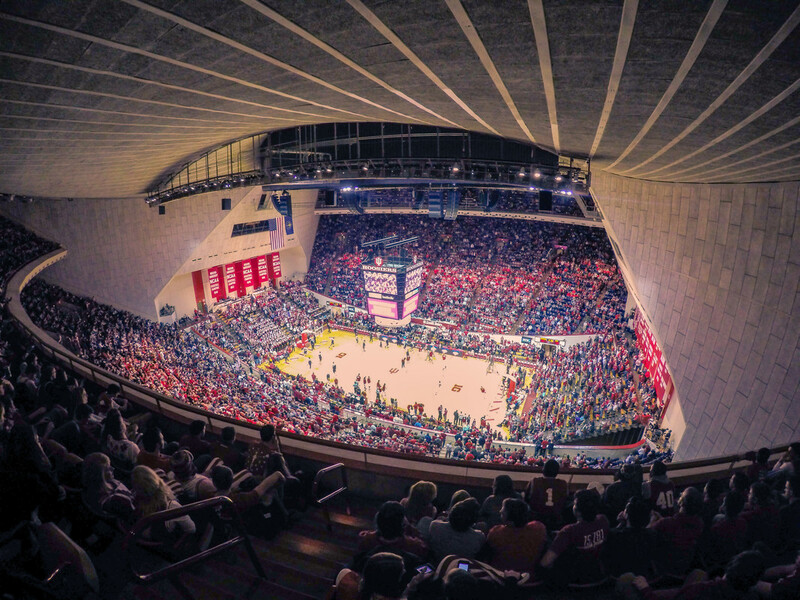 Indiana boasts strong wins over Marquette, Northwestern, Louisville, and Butler already, and Assembly Hall can be a very difficult place to play. The Hoosiers will have a chance at a season-defining upset here. Simply put, this could conceivably be the year that Kansas finally falls short of a Big 12 title. The Jayhawks have won their league a remarkable 14 straight times, and are favorites to do so again this year. But Texas Tech is a legitimate Final Four-caliber team, and one of the tougher conference opponents a Kansas team will have seen in several years. The Red Raiders nearly knocked off Duke at Madison Square Garden, and have the defensive ability, and the star power in Jarrett Culver, to knock Kansas off at Allen Fieldhouse. If this happens it will give Texas Tech a shot at ending the streak and getting on people’s radar as a real national title contender. If not, Kansas will once again be on cruise control. St. John’s can be incredible on any given night, Georgetown has gotten better, and Seton Hall is always capable of an upset. But right now it still seems likely that Villanova and Marquette will wind up being the class of the Big East. This first tilt between the two sides will go a long way toward determining the conference outcome and who gets the best seed out of the traditionally terrific league. It will also be both teams’ best remaining shot at a high quality win, and both teams could use it after some early ups and downs. Gonzaga looked like the best team in the country after defeating Duke in Maui, but the Zags then promptly lost two straight to Tennessee and North Carolina. Now the path to a 1-seed gets complicated, because Gonzaga doesn’t have many more chances to impress in a weak conference. Saint Mary’s is the only conference opponent anywhere near Gonzaga’s level though, which makes this away game fascinating. It’ll happen in early March not long before Selection Sunday, which means presumably that a loss will end any hopes that may remain for Gonzaga to earn a top seed. A win meanwhile, if Gonzaga stays perfect between now and then, might push Mark Few’s squad back to the top line. Right at the top of the NCAA website’s own list of fearless predictions for the rest of the season, it was stated that Kentucky – not Tennessee – would win the SEC. But here the assumption is that Kentucky isn’t even necessarily in the top two come March. Instead it could well be Tennessee and Auburn, both of which have shown upside every bit as tantalizing as Kentucky’s (which frankly seems limited). This game at Auburn could be Tennessee’s chance to lock up an SEC title and an NCAA 1-seed. It also gives Auburn coach Bruce Pearl the chance to beat his former school and keep Auburn on people’s minds as a difficult NCAA Tournament out. This should be one of the best games of the final days of the season.